The educated diving knife that mixes style and substance and combines style with substance to make this knife a brilliant companion. Thee knife combines a serrated edge with clean side to maximise cutting potential. 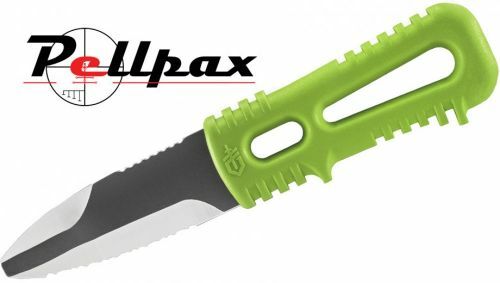 Its blunted tip makes the knife perfect for taking on inflatables whilst the glass filed nylon handle is coloured green to maximise visibility. The blade is 420 High Carbon steel that maximises resilience as well as maxing the blade immune to rust and corrosion making it perfect for divers, fishers and campers. Comes with PFD compatible hard plastic sheath.